AND a custom control panel server (for those of you who have severe trust issues). 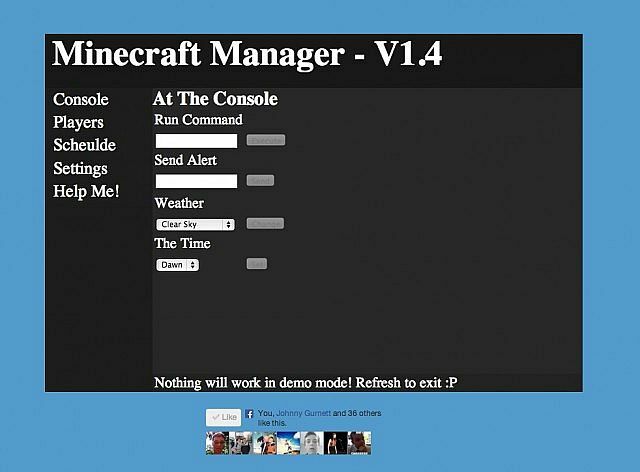 Click here to go to the Minecraft Manager! I have made the first Minecraft control panel that runs on RCon (which is built into every Minecraft server since 1.4.7) and is seamless. Apart from making a server and enabling RCon, there is no setup and absolutely nothing else to download, so there is no way your computer will catch a virus. A feedback tab so that you can help me improve! Send commands from your website directly! The last letter of every server response is missing. I promise a fix at the weekend (Already know what is causing it). Here are some steps in order to set up RCon on your server, which is built in already. If you like some of the things I make then you can show it by giving a shiny blue thing. Yes. This panel is perfectly safe. For your knowledge, I log commands, queries and your server IP for debugging but RCon passwords are not logged. However, for the minority of you that don't trust me, which I don't blame you for, I will be adding an option for you to host a copy of the panel server yourself but this will take quite a bit of unneeded setup. I value one great piece of feedback way over several diamonds because that is the only thing that allows me to improve my work. Please take a couple of minutes to write some and either comment down here or submit it inside the panel. If you are on YouTube and make a review of the panel, I will put a link down here and the best review will be featured next to the images. Great. Comment down below and I will check and answer to my comments every day, just as I check my PMs. I will not respond to PMs asking me about this, since comments allow others to read my answers. does this help people make servers im derped out ? The download is for a custom panel server. Can you please explain why you would release a program with such an awful typo as Aplha? Hello, just a tip you probally know this but a great mod such as these if you want them to stay post them on unknown websites... Just so they don't get patched. 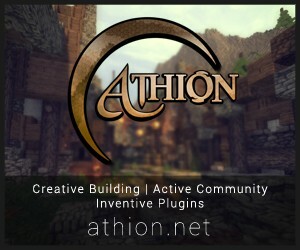 Its a great mod, just if you want it not to get taken away by Notch. Don't post these type of things on a big website such as PMC. Great mod though. xD Yeah I forgot. Just making sure so your hard work doesn't go to waste. The mod requires no server side installations. The RCon port (usually 25575) needs to be port forwarded. do i have to port fword? Yes. The RCon port has to be port forwarded. oh so its just like doing it the old way? Thanks. This program is supported by the vanilla server JAR, so installation is unneeded. Just curious, how is this any different than just the standard minecraft server jar's setup? Not trying to say this is or isn't useful, but I don't see anything that the standard jar doesn't do. 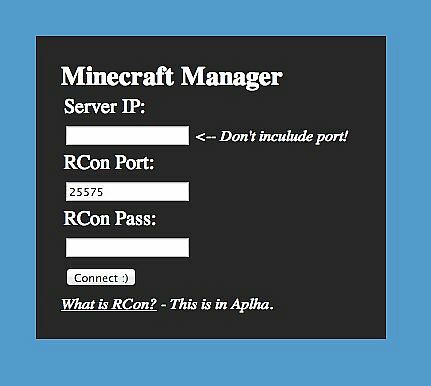 This allows you to connect to your server via the web (eg on your phone) when not on Minecraft & makes confusing commands very simple. The normal server JAR supports it. Ah, now that makes sense, it's just an alternate access rather than the normal console. Sorry, looked at this when I was half asleep earlier, makes a ton more sense now. Good on ya. If this was an actual program and not a web app, I'd use it. However, because it's a web app hosted on the poster's site, I don't feel safe using it, as the site could store our connection information. I could offer for people to optionally host the panel server, although it would mean setup. What do you think? I think that would be a great alternative. Indeed you do have to trust tools like this and even though I do not log RCon passwords, I easily could. 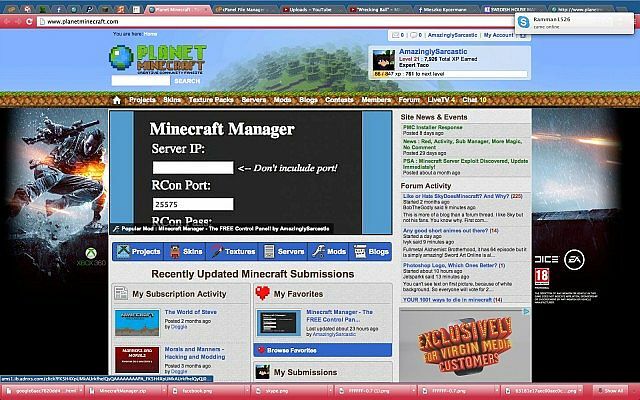 The tool however was made for new server users to find things much easier than normal.